We’d love your help. 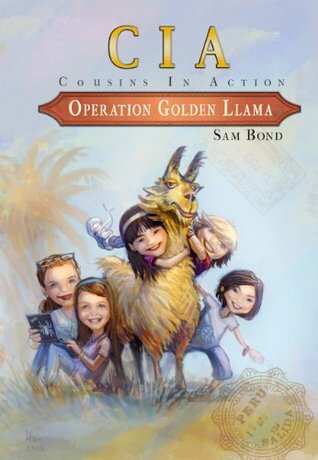 Let us know what’s wrong with this preview of Operation Golden Llama by Sam Bond. To ask other readers questions about Operation Golden Llama, please sign up. My daughter (12) and I read and reviewed this book for Mother Daughter Book Reviews. Please visit us for our full reviews. This book is about five cousins (Cagney, Olivia, Tess, Lizzy and Aidan) who go on vacation to Peru with their grandma who goes missing when they land. They then discover that there is a hidden treasure somewhere but someone is planning to steal it. So the cousins must foil the villain’s evil plans and find the treasure first. I liked how it was Tess that saved all the cousins because it is basically saying that young kids are capable of being very brave. There were lots of parts that I really liked. It was a fun mystery and adventure. I don’t think it made sense how the grandma had a connection with everyone in Peru and that she would abandon her grandchildren in a strange country. Also why did the kids get grounded because, a) they saved the treasure; and b) the grandma brought them to Peru and abandoned them so why is the grandma not in trouble? I learned that the capital of Peru is Lima and that its population is 8 million. Peru is in South America and people there speak Spanish. I also learned a lot about the history of Peru and the people of Inca. I learned that Machu Picchu is an ancient city on top of a mountain in Peru and that the Inca lived there. I learned that Choclo (a peruvian dish) is not actually made out of chocolate. I thought that the book was pretty funny and cool and I really learned a lot about Peru. At some parts it was confusing, but overall, the story was awesometastic! I think kids 8-12 would like this book. When a good friend writes a really good book, it's a five-star kind of day. Sam's lovely debut is middle grade at its most fun. Adventure, mystery, danger - I raced through it! Great job, Sam! I cant' wait to read the next one. A delightful adventure with a diverse cast of characters. Pure fun!